If you are currently an iPhone user and you are thinking of switching to the new Google Pixel or the Pixel XL, then you might not really be facing any problem at all as Google has just released a video with step by step guide on how to go about it. 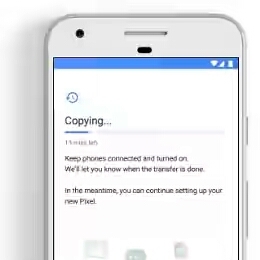 The video which is called "Switching from iPhone" is a part of a series which is known as Pixel Tips. This particular video shows you how to easily switch from you iPhone to Google Pixel or Pixel XL. According to the video, before you start the process of moving your contents from the iPhone to the Pixel, you need to first turn off iMessage and FaceTime, you also need to make sure that there is at least 50% battery life on both the iPhone and the Pixel. After that, you have to connect to a Wi-Fi network, connect your iPhone to the Pixel using a Quick Switch Adapter, and you're good to go. The Quick Switch Adapter is actually included in all Pixel and Pixel XL retail boxes and it comes for free. This is really a way of Google trying to take a jab at iPhone. But let me know what you think. So for the iPhone users, will you really be willing to ditch your precious iPhone device for the new Google Pixel smartphone.